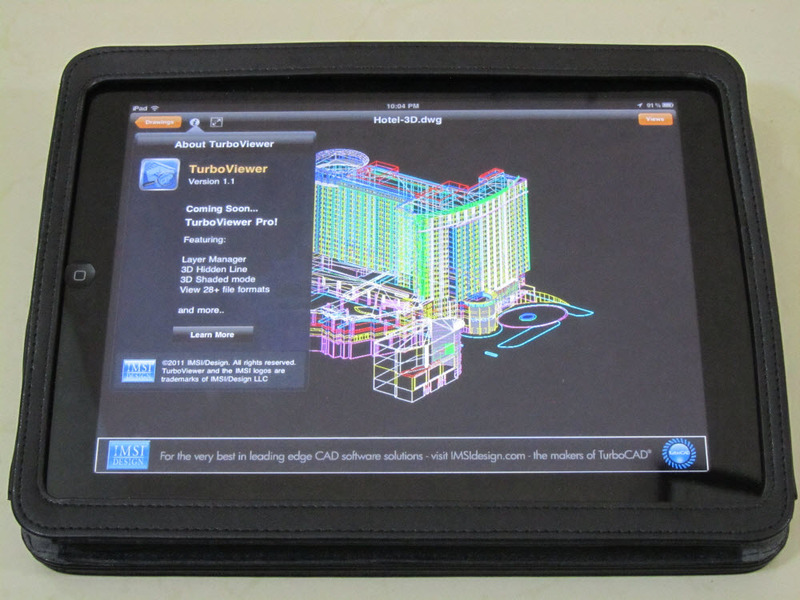 In a press release issued yesterday IMSI/Design announced the release of TurboViewer, the first 3D DWG viewer for the iPad. The app is free and can be downloaded here. Autodesk has AutoCAD WS mobile for the iPhone, iPad and Android which can view DWG files, but it cannot navigate in 3D. That’s why IMSI/Design is making it a point to rub it in that they are the first 3D DWG viewer for the iPad. TurboViewer can view 2D and 3D DWG and DXF files. It detects whether the loaded file is 2D or 3D and sets up the appropriate gesture navigation mode. Like other 3D views for the iPad it has multi-touch zoom, pan and orbit. It doesn’t need an internet connection which is a good thing when working in the field. However, unlike Autodesk’s iOS offering TurboViewer does not offer markup features. I hope that is coming because without markup I’m not sure how much use this app will be in the field, which is where I presume it is supposed to be used. The upcoming Pro version will have a layer manager, 3D hidden line and shaded modes and will be able to view more than 28 file formats.